At Island Style we know water sports are an amazing way to help build self esteem and confidence in children. Marine environment experiences instill respectful attitudes for life. 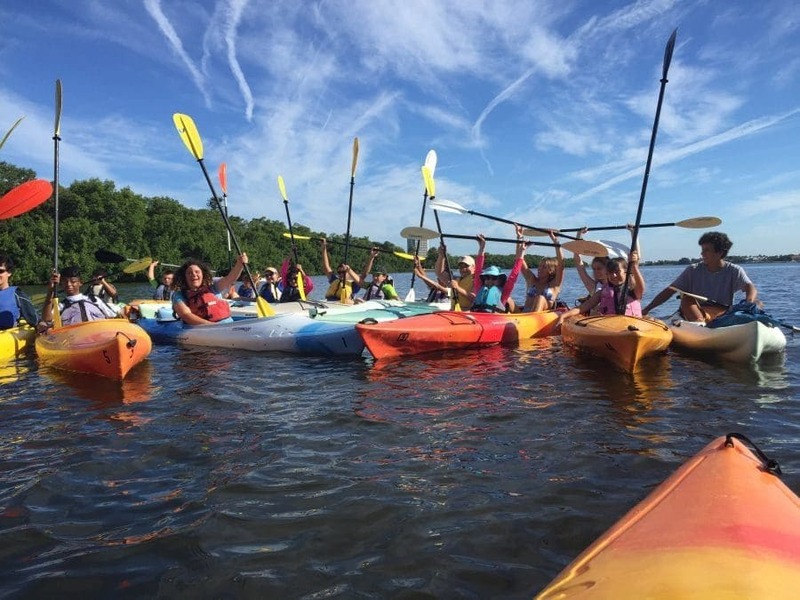 Not every child will become a life-long paddler, but memories of this Summer Camp will last a lifetime! Campers will experience a variety of water sports and adventures like like kayaking, stand-up paddle boarding and exploring the wonders of the barrier island marine environment. Participants will be introduced to water safety and key environmental awareness issues as they embark on daily paddling expeditions and adventures to mangrove islands and sandbars teeming with exciting and interesting marine life. Locations are selected to ensure a fun, adventurous and safe experience for all such as South Lido Mangrove Forest, Otter Key and Sarasota Bay. Week-long camps run throughout the summer months with half day sessions starting at 9 am. We offer a low teacher to camper ratio 1:8 to ensure a fun, safe, and unique experience for all. Your child will complete the camp with higher self-esteem by learning new challenging sports and having a full week packed with fun and discovery. When parents see the fun we are having- they want to come too! Our mission is to cultivate a respect and love for Nature and the Environment while building personal confidence and strong bodies. A one week, specialized, teen program with lots of hands-on, individualized, expert coaching make learning to windsurf a breeze. In low wind conditions, campers will be treated to stand-up paddle boarding and snorkeling excursions, and will have the opportunity to learn kite flying in the right conditions. Water safety and basic navigation information is a crucial component of the curriculum and is more extensive in the teen program. After a week of fun and learning your child will have a renewed sense of wonder and the self-esteem that comes from learning a new and challenging sport. The week begins on July 13th and is available from ages 13 – 16. Child-size equipment and lots of hands-on, individualized, expert coaching make learning to windsurf a breeze for kids. When they’re not riding the wind, campers will be treated to stand-up paddle boarding and snorkeling excursions, and will have the opportunity to learn kite flying in the right conditions. Water safety and basic navigation information is a crucial component of the curriculum. After a week of fun and learning your child will have a renewed sense of wonder and the self-esteem that comes from learning a new and challenging sport. Half day sessions start at 9am and run throughout the summer months. Call or e-mail for availability and to reserve your spot…it will be such a thrill when you see your child windsurfing in just a few short days!